Exposure to organic dusts, chemicals, or animals at work can cause the development of all sorts of allergic responses. The clinical history usually provides the first clue by the association of symptoms with work, and recovery with absence from work, but it is seldom so clear-cut because prolonged reactions are common, and daily exposure adds up towards the end of the week. It is very important to make the diagnosis of occupational allergies as early as possible because if there is a long delay before diagnosis the asthma may not improve on removal from exposure, and persist indefinitely. Allergy to dust mite or animals as well as to the occupational possibility can co-exist and confuse the situation, so expert advice on sorting this out may be necessary. The patient was perfectly controlled to begin with by using Becotide in a dosage of 200 mcgms twice a day, but all tests were negative and the cause was not found.. The Becotide controlled the asthma completely, but this successful treatment actually obscured the cause of his asthma completely. I like to control asthma with as little medication as possible, so I cut the dose at his second visit and suggested that he should reduce it further if possible. At his next visit his peak flow chart showed this obvious weekend pattern with worsening from Monday to Friday, indicating a work problem which was quite unsuspected. This cause was found to be an isocyanate well known to cause asthma, so he changed to an outside job, stopped the Becotide altogether without relapse, and has had no further asthma. The peak flow charts before and after the one below are not shown. The important message from this case is that had the dose not been reduced he would have continued taking a dose of Becotide which would suppress the asthma completely, so everybody would have been happy, for a time. Eventually the asthma would have become more difficult to control, so more and more drugs would have been required. Permanent remodelling of the bronchi would eventually occur, so that even if he changed his job or stopped working altogether he would be unlikely to recover completely. The cause might never be suspected, and he would become a chronic “intrinsic” asthmatic, who would never be diagnosed as industrial asthma. Insects are very liable to cause allergies, particularly many species of mites, cockroach in warm climates, ants, and so on. 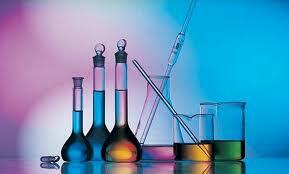 Laboratory workers who work with animals are liable to become allergic to rats, mice, guineapigs, etc. They are at particular risk because the main allergen in rats, and probably other animals, is in the male urine, which dries up and becomes airborne. This can be a serious problem which can wreck a promising career linked to the causative animal. In the past desensitisation could be tried here, but nowadays this method of potentially curative treatment is not used in the UK., If there is difficulty in controlling the asthma the victim might have to consider emigration to get desensitised without changing their research interests. Hairdressers handle many potentially nasty chemicals in the course of their work, particularly when doing permanent waving, in which persulphates are used. Hairdressing is not an occupation for the allergic person. 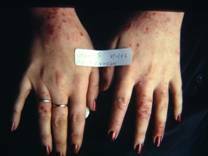 Skin sensitisation is common, and the future in this occupation may be compromised. 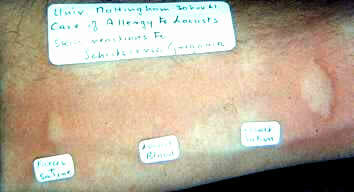 At right are pictures of the hands of one such patient. Healthcare Personnel are increasingly at risk of sensitisation to latex, as a consequence of greatly increased use of rubber gloves in recent years. This also applies particularly to children who have been subjected to many operations, such as for spina bifida. The development of rubber-free vinyl gloves has helped a great deal, but latex allergy can be very intense, causing all sorts of allergies including anaphylaxis, and can sometimes be triggered by many fruits with similar allergen molecules. Further details are easily found on the internet. On the right is an example of a provocation test with two powders used in making dentures. 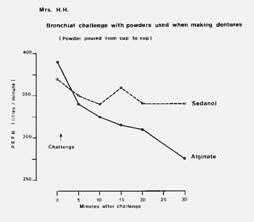 It is very obvious that pouring the alginate from cup to cup produced definite asthma, peak flow dropping from nearly 400 to only 150 after 30 minutes. Glutaraldehyde The development of flexible endoscopes has also entailed the introduction of sterilisation using Glutaraldehyde, which does not damage these very expensive instruments. Unless great care is taken this sterilising agent can sensitise susceptible people, just as latex has done. Allergy to Nickel is very common, and can be diagnosed easily because contact with the buttons on jeans or clips on bras which are nickel plated produce a rash where they touch the skin. This case is exceptional, as he was an accountant who got fed up with his job and bought an old pub. 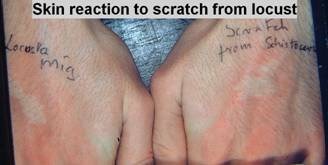 Within few weeks his hands were as shown in the photograph, with the skin peeling off. The handles of the old-fashioned beer pumps on the bar were nickel plated, hence his hands had much contact with nickel. A short course of oral steroids soon suppressed this reaction, and as he does not touch coins he has had no trouble since the handles were changed to chrome plate. 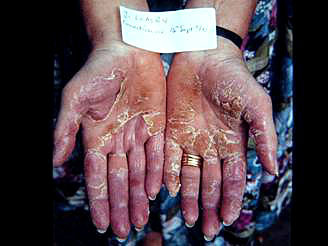 The partner of another patient developed eczema limited to the index and middle finger of the right hand. Her GP wanted to send her to a dermatologist, but she refused and insisted on seeing me. They had recently bought a pub, and she was constantly scooping coins out of the till with these fingers when giving change. Certain woods will cause allergic asthma. The most researched is western red cedar which has caused much asthma in the lumber mills in Canada and has been intensively researched. Resin in pine wood may cause asthma in those who are allergic to pine resin, (colophony). Various tropical woods can cause problems if the dust is inhaled, and it is always sensible to wear a mask if there is a lot of wood dust. Willow dust has been reported to cause asthma in aspirin sensitive workers because the wood contains salycylates! 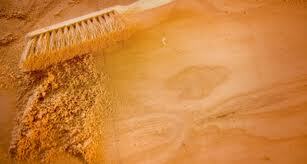 Workshops today are very conscious of the risks of wood dust and it is mandatory to have effective dust control systems. Before these precautions were put in place woodworkers were liable to cancer of the nose, the first part of the respiratory system that dust contacts. In woodworking factories plywood, and various materials composed of sawdust and formaldehyde resin glues are also a risk factor for asthma. Colophony, or pine resin, has caused much occupational asthma when used in cored solder in electronics factories, and exceptionally in violinists who use it on their bows to make them slightly sticky. I had one patient who worked as a secretary to her husband, who ran a big woodworking shop. She developed severe asthma, all tests were negative, and it was only by using a peak flow meter and a careful diary that it became evident that the cause of the problem was in the office. Although she never went into the workshop enough dust could get into the office to trigger her asthma. The answer was not obvious because there was a prolonged delayed effect from exposure to the office. The actual wood which was the cause of her asthma was never identified.